While styling your hair, don't forget to utilize its versatility. That's what this girl wants to demonstrate with her curly hair. As you can see, she has first styled it with a coiled bun at the top, while the rest of the hair flows down. 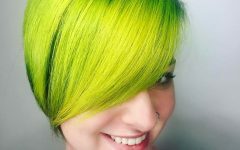 All that matters in hairstyling is creativity, so get playful with your hair. Like we have said, natural hair has lots of possibilities. And with that, we are talking about any length of hair. In this one, this girl wants to leave everyone's mouth open with her glowing coils. By the way, you must look at the sides to get all the details. First of all, we must mention that she sticks to black color on the sides, then she pulls all the hair up. From there, everything goes wild with coils. You were looking for a style that conceals short length, and here you've got one. Do you want a style that talks while you watch? If you answered yes, you have to know that this girl looks calm not because she doesn't have much to say, only that her hair is making most of her statements. This wild curly style with red floral crown trickles all beauty. In brief, we have curls all over the hair creating all the captivating effects. From there, we have the hair flowing to the sides, filling all the elegance to this girl's round face. 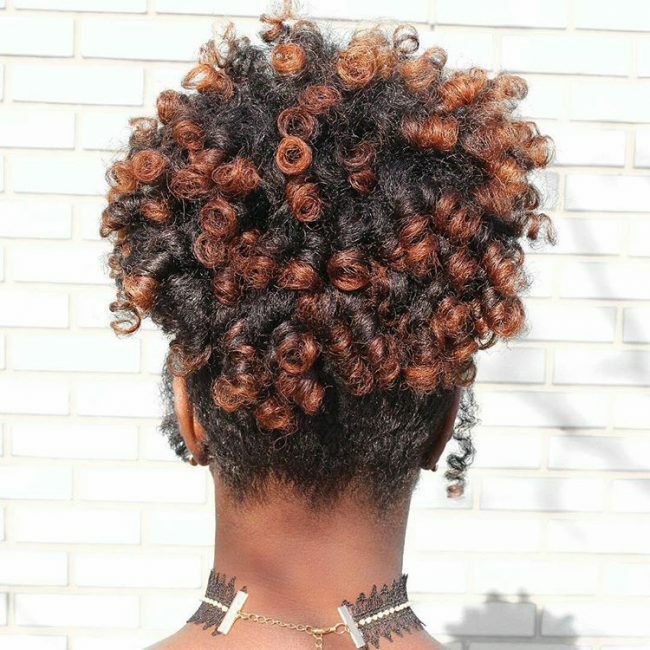 Throwing your curls to the side creates a side-swept effect that yields mystery to your look. Save that somewhere! If you are feeling bold without a joke, compliment this appeal with the big earrings to pull out a daring appearance. And watch out, the round-faced girls who have been having nightmares with their hair will be so jealous of you. This one is the exact hairstyle that no much words can explain, rather than the ones saying that it's a style worth keeping your friends livened up in a busy talk. Without a doubt, this one is a high-class hairdo. 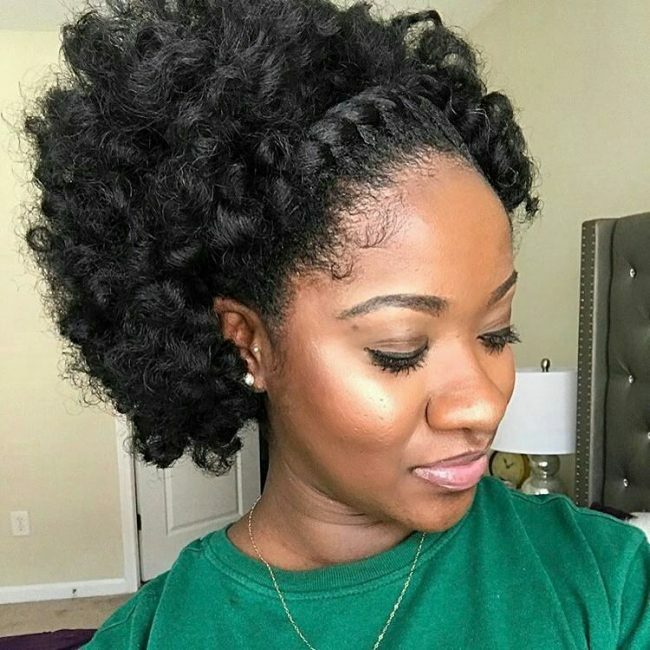 Many people seem to have a hard time with baby hair, but this girl has mastered the way of turning a challenge into an opportunity. 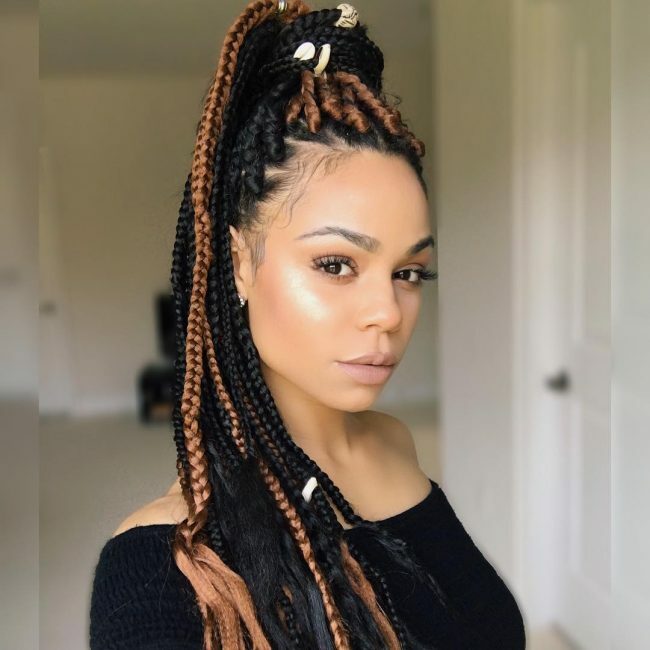 Settle on this braided hairstyle to make a statement with your natural hair. 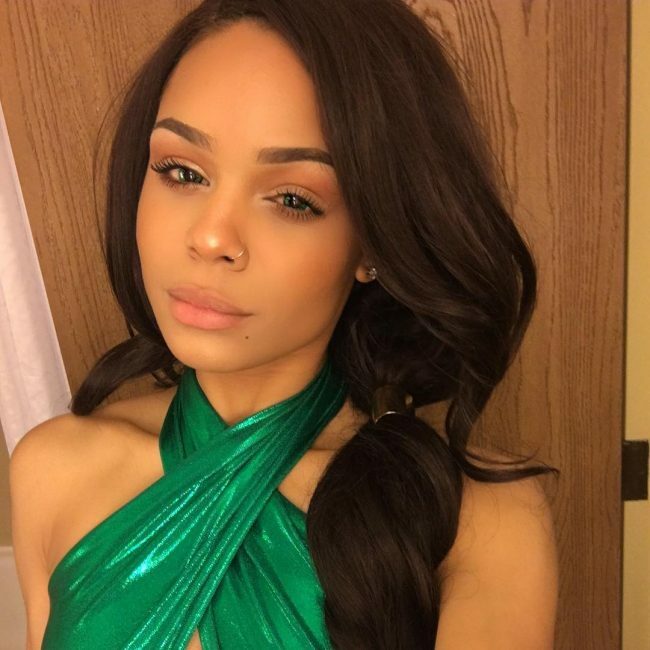 If your friends thought that they could pick a competition with you in styling, take this look to show them that they have a long way to go. Instead, they can only watch you climb higher on the trend. Something you ought to know is that this style is easy to create, though it looks complicated. 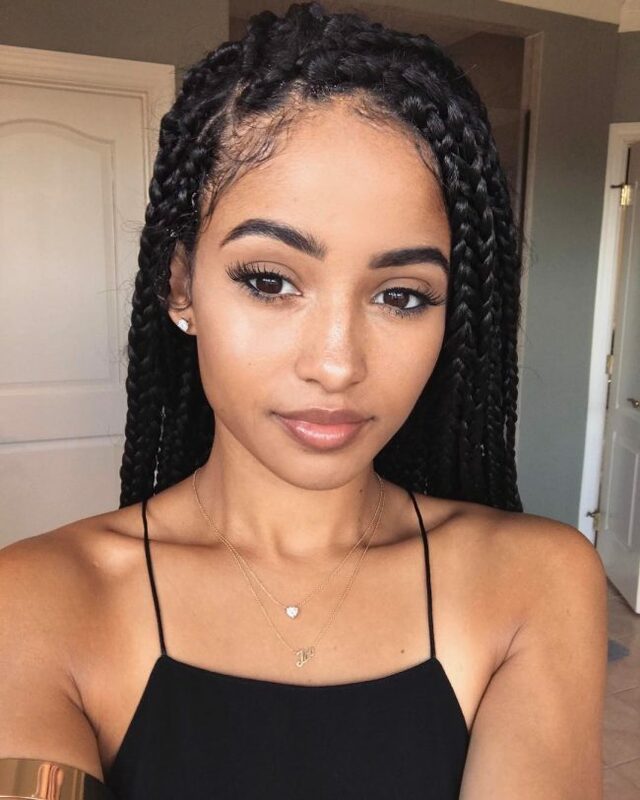 Just create the braids, pull them up, and then finish them with one braid. 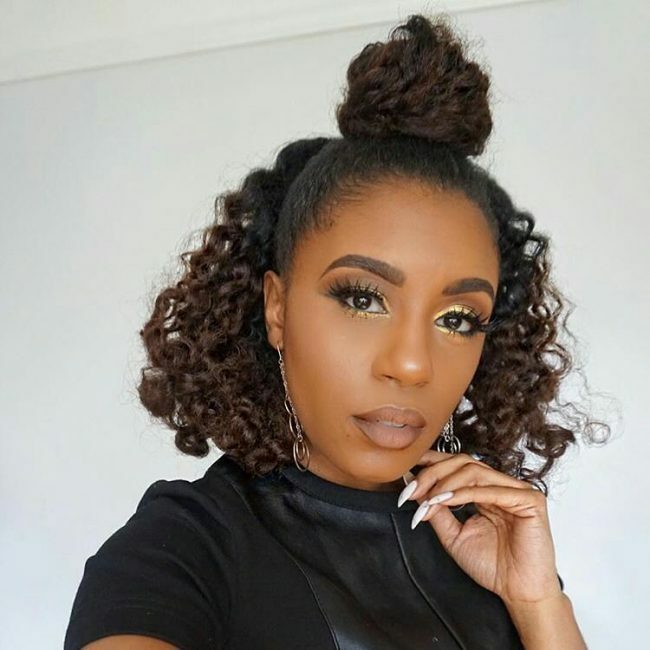 The reason why girls with natural hair will always lead in styling is due to taking advantage of the versatility in their locks. Take for instance these braids. You will not deny that there are a million ways of turning this hair into a different look, won't you? You can let the locks flow free, you can pull them back and secure a bun, or you can create a braided ponytail. Settle on this hairdo to cook a new style every new day. Nobody will blame you for adding extra flavor to your already fashionable style. It's called taking your classic style to another top level. Let's say it's moving from excellent to another top notch. 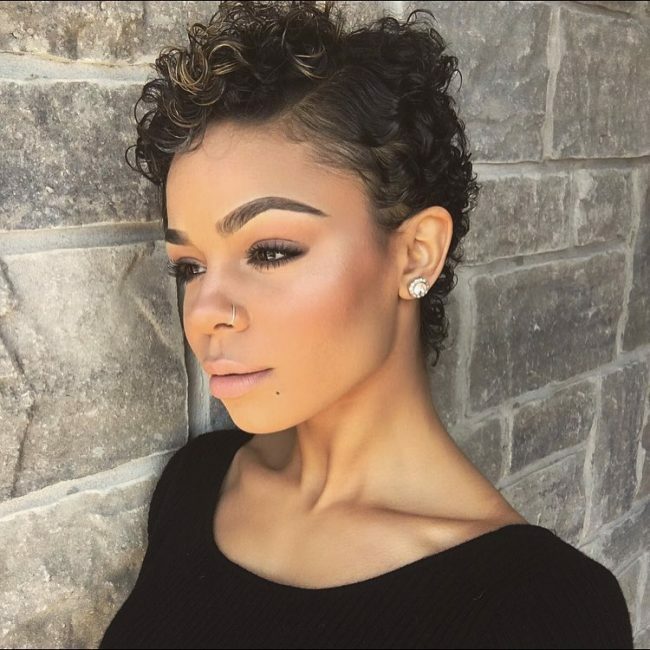 Originally, its an exceptional 'do with curls in addition to the way they're brushed back. But how would you explain the super braid securing the locks around the hairline? No words, right? Some styles seem to come from the list of a standard version of styling, but wait until you create them. People start looking at you as if you brought something from heaven and placed it on your head. 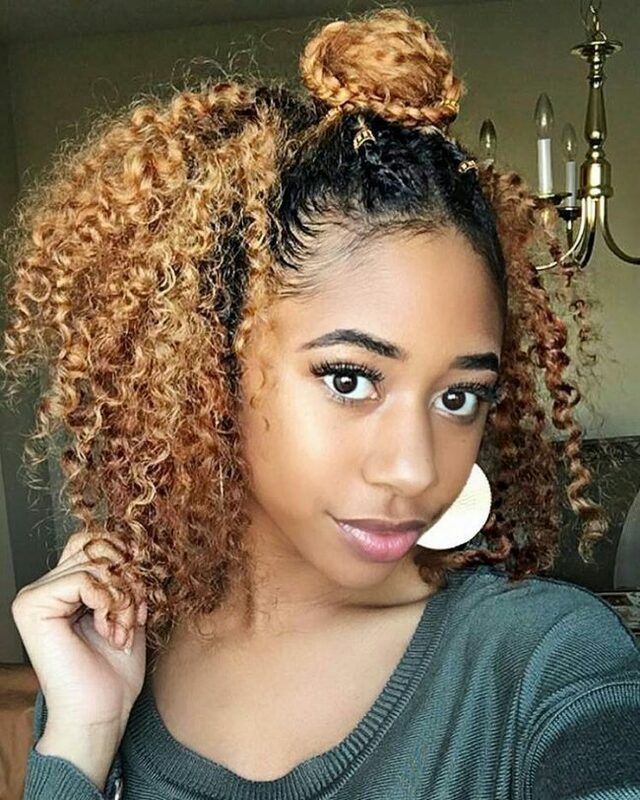 This bun is one of those styles that pulls out the heaven like effects. 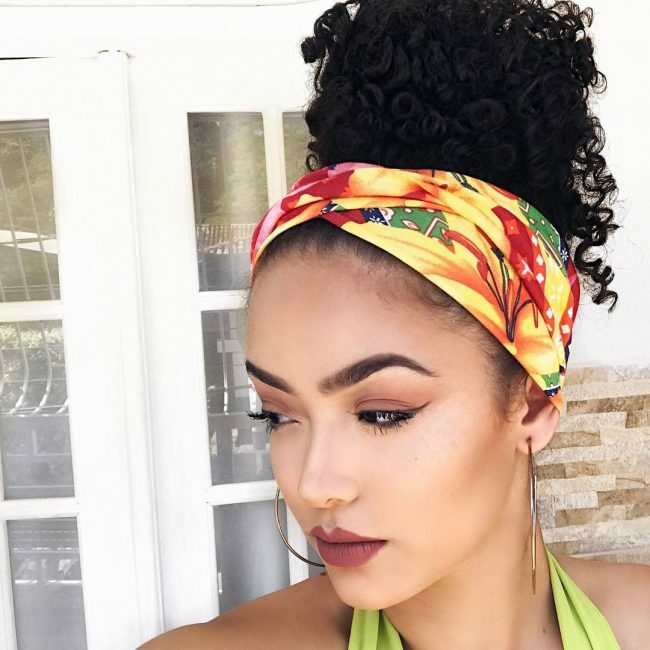 We don't know where the mystery lies, but maybe because many people forget about pulling out a curly bun. If you're preparing for a dance, don't bother going with a neat hairdo. 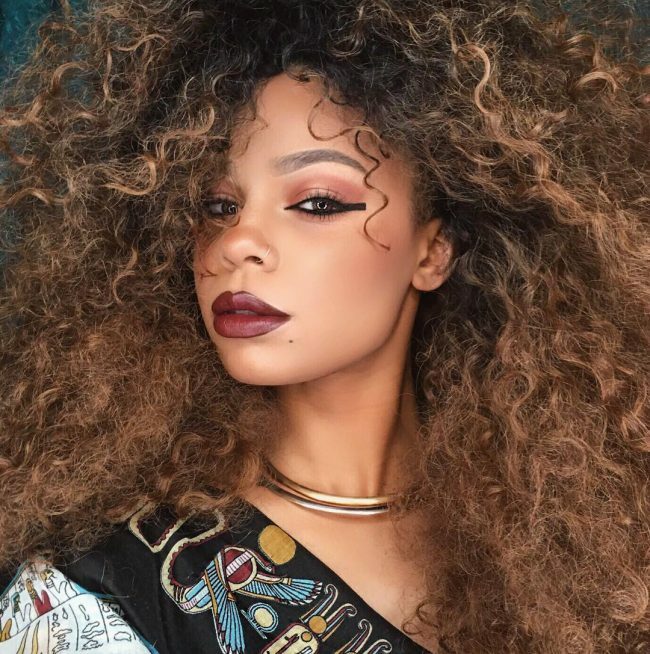 Try messy curls featuring an excellent volume. The biggest mistake would be showing up with neat style with everything falling into its place. Do you know why? It'll look bad when the dance moves create a messy style out of a neat one. So, go with a messy style, then the dance moves will make it messier, hence more classic. Creating a style that serves for both a formal and casual appeal is not easy. With that, you better stop thinking about the expensive and complicated hairstyle. Follow this girl's way. That is, working out the buns' secrets. Buns are excellent. Rock them a time and a time again, and nothing will seem out of shape. The only secret with buns is always to try and make them neat by taming the flyaways. If you'll be offering a speech or something that would need some attention, this girl has the right style that will drive all points home. The style will not only help in garnering attentions, but it will also give you lots of confidence. Get ready for bold statements. Do you have short hair and want to make eyes pop from anywhere you go? Why then waste time with hairdos that don't seem to appreciate your efforts. Just settle on this with a braided that needs you to only give a room along the hairline to mount the braid. 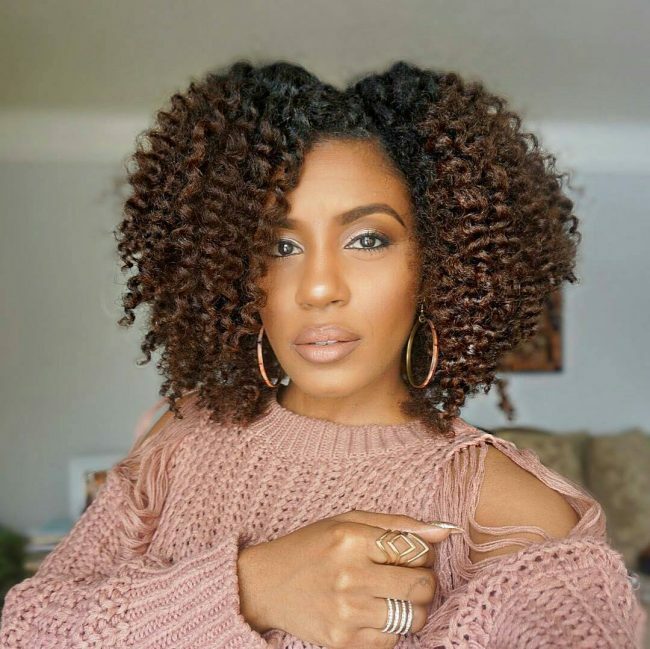 No time to style your long curls? Just pull the back and let them feel the mother nature. If you note that they are still demanding for something more, calm them by running your fingers through. They will go with you communicating a stylish girl. If you've made a decision to look classy, go for a style that's fully packed with eye-catching elements. When wearing such a look, you'll have an easier time to spruce it up further when the need comes. In fact, you'll just add a floral headband like in this look. 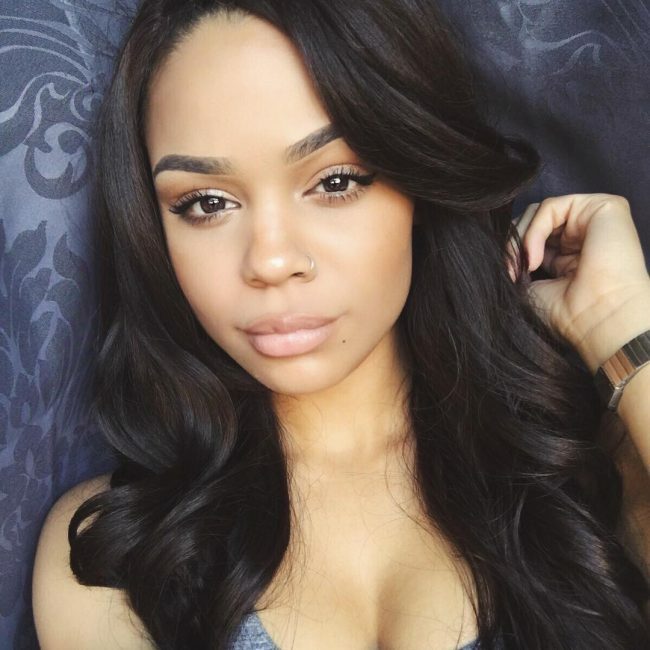 Side-parted hair with flawless strands looks great by itself. 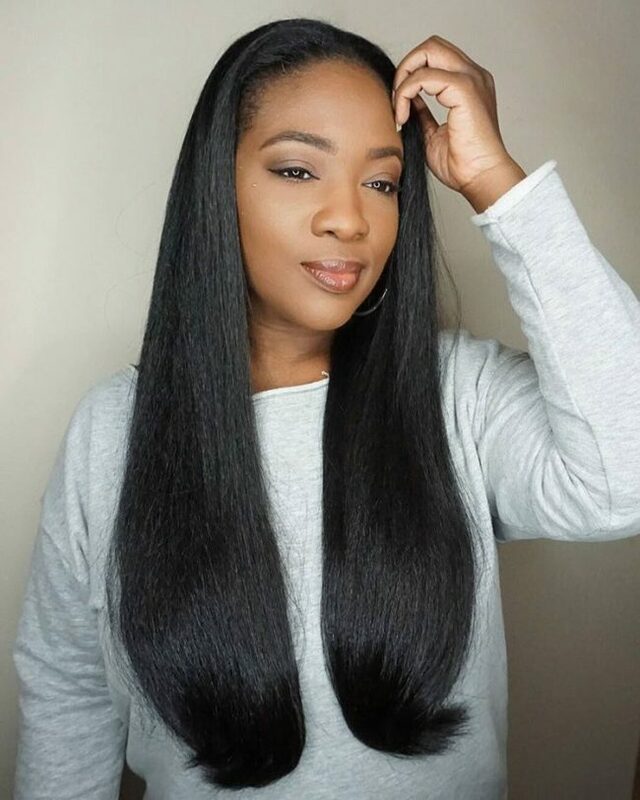 The best thing is that such hair doesn't require you to scratch your head trying to fit all the styling products into your budget. It's less costly to manage not to mention that it's easy to create. Just think about it. It doesn't have to cost you when parting your hair to the side of your head, right? Save money and time with this style. This chic bun is an alternative to anyone unwilling to let her hair flow, yet they want to create an eye-catching look. 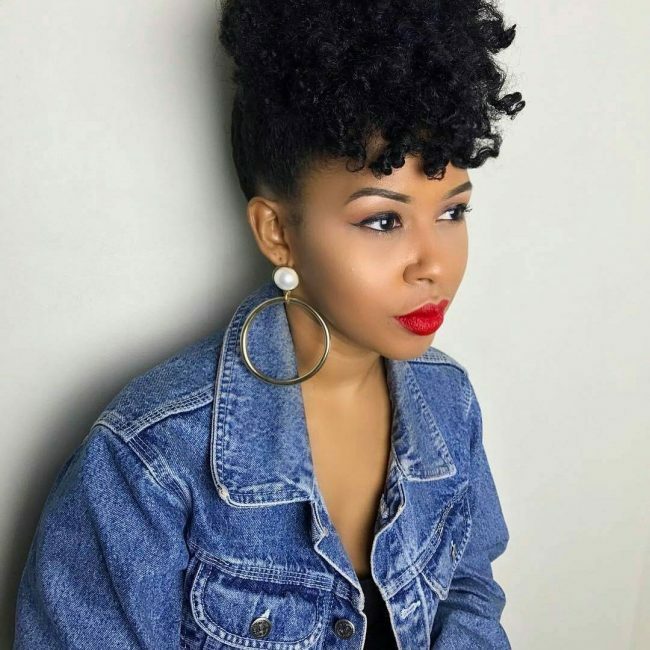 Sincerely speaking, buns are the first-rate hairstyles for natural hair. They are also excellent for anyone who is always on the run because of their effortlessness nature. You just pull your hair up and rock it. And as you can see, this look is worth to stop any traffic. It's not a joke! 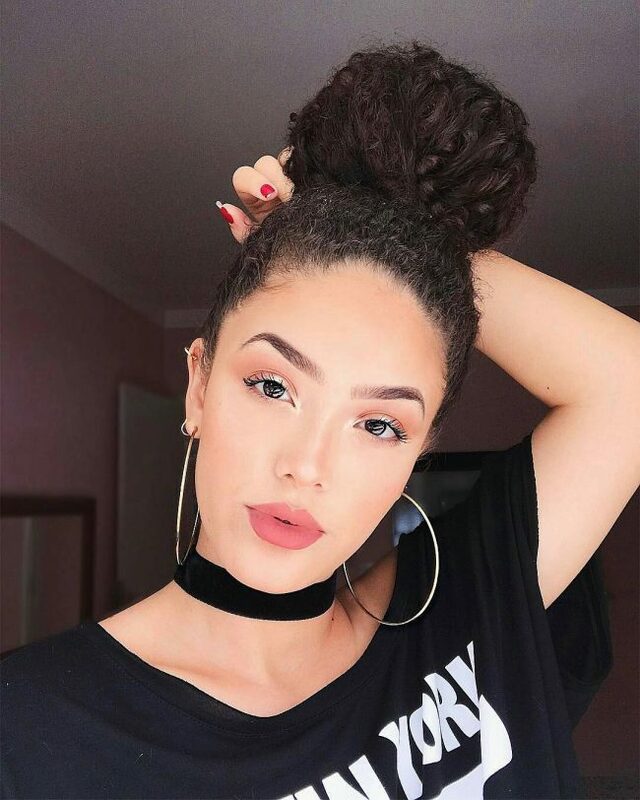 In this style we are toying with natural hair, nothing else. Start by creating different sections with your hair. Five or four will create the exact style. Take each section and divide it into three portions. With the three sub-sections, start criss-crossing them from the hairline to the back of your head. Do that with each section. You can secure the tips of the braid with an elastic. If your hair is long enough, and you want a style that can serve as both casual or formal, here you've got your salvation. Here is the trick, on a day like Friday, brush your hair down as like this girl making sure you're featuring the same side swept. In the evening, go wild and pull out a bun or a pony. You only need to play with your hair for less than five minutes, and no one will recognize you in your new casual look. When you're dressed to kill, even your environment knows that it's handling a special person. Anything you add to your beauty turns out magnificently. 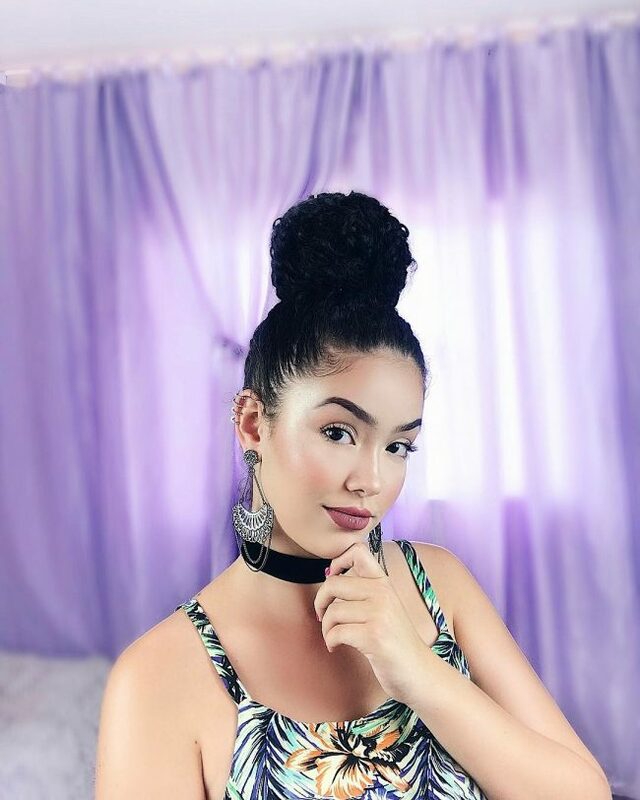 That's why you see this girl's makeups are adding up well to her hair. This style truly proves that you don't need to spend all of your fortunes to get a charming look. Just color and brush your locks. 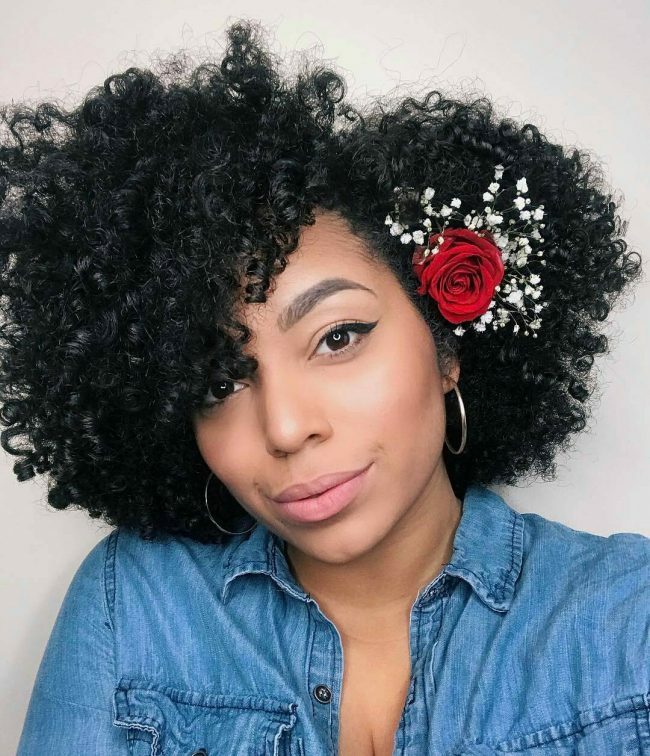 If you find yourself addicted to afro styles, don't worry because you're not alone. It's one of the hairstyles that are sweeping the floor. Apart from that, many naturalists are rocking the afro style and then going further to throw it to the sides to make it look exceptional. 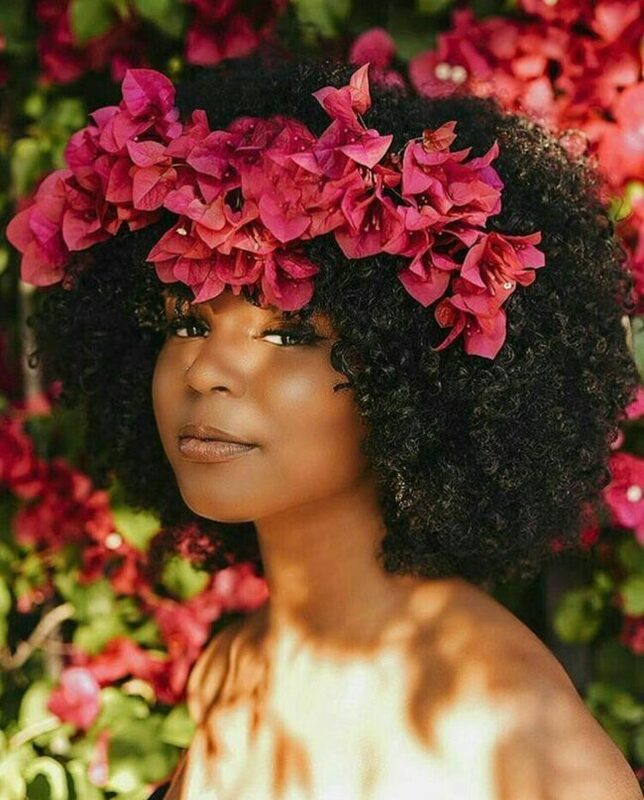 So if you're an afro woman, copy this picture and add the flavor of a red or white flower. 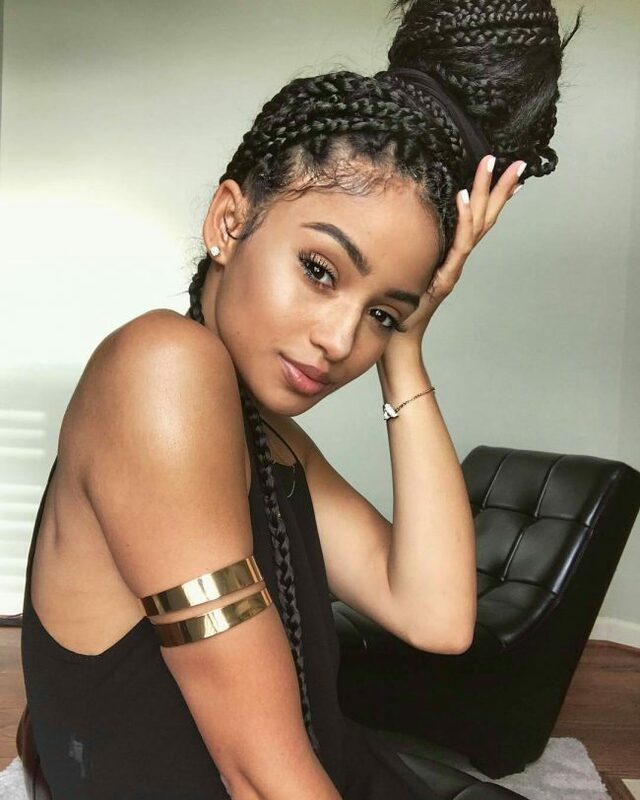 We've got a gorgeous braided style that will serve as our instant solution for a protective hairstyle. Do you know how to create a braid? Almost any woman do, and that's the beauty of this look. 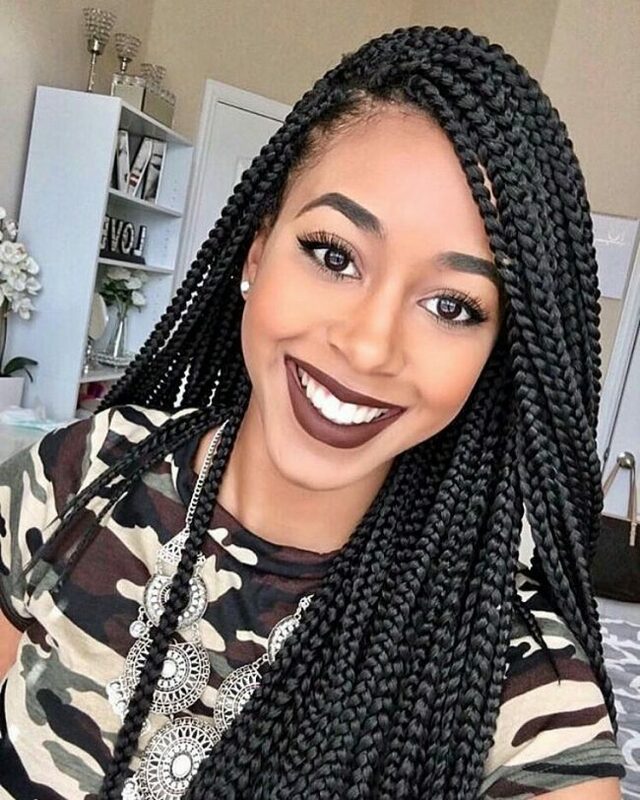 The only thing you need is different colored braids to create the color mix. In whatever way you'd think of this look, just keep in mind that it's timeless and effortless. 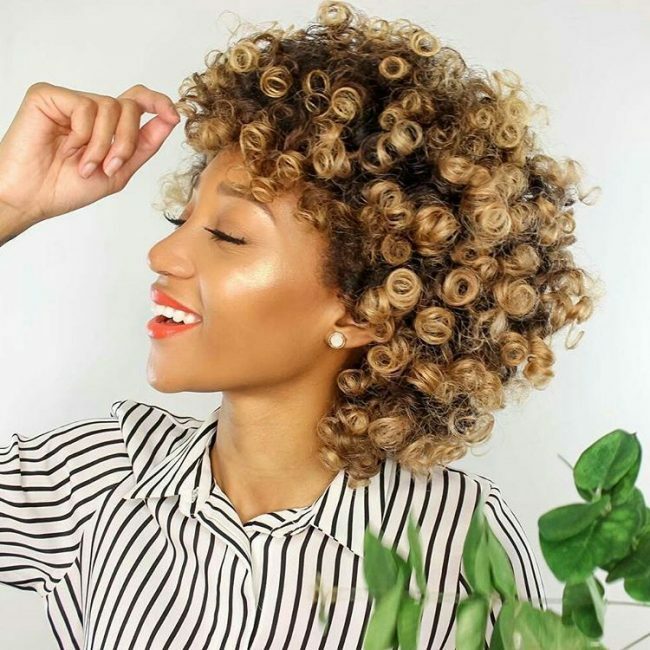 Besides all those, it’s a perfect �do to take for those days you really want to show off your natural locks without looking too expensive. 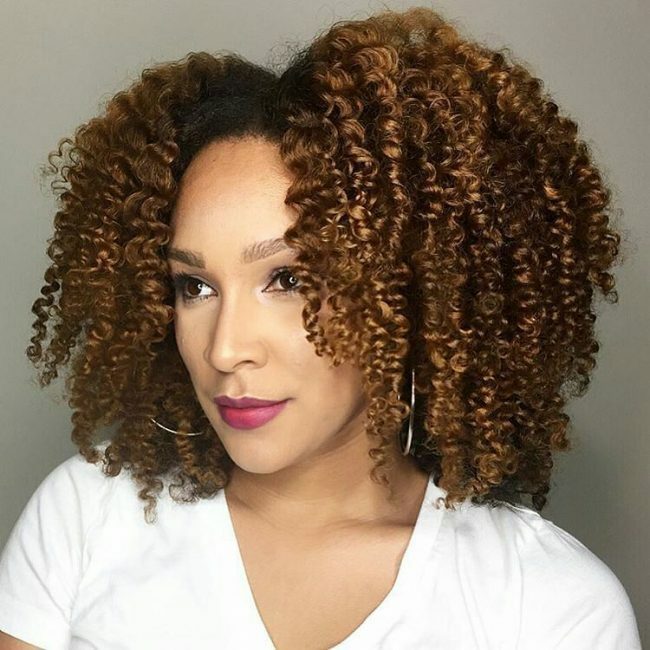 The style features flawless curls all over the head. There is also a sleek line dividing the bang section and the rest of the hair. For sure, you don't expect anyone to look away from this look. When you want to draw some attention to your personality, the best way is to let your kinks get crazy. Do that easily by sporting a hairstyle that's rich in color and texture. Such a style is no other one than the one shown right here. Get enough volume, and then bring your hair forward for a face-framing effect. Be sure to win in all the contests. 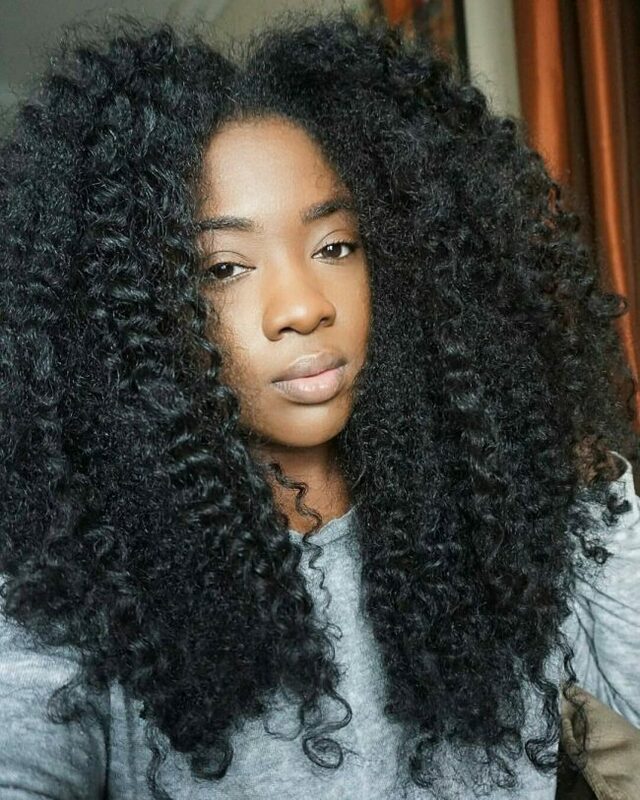 It seems like black natural locks look sophisticated with every design you throw to them. Be it braids, or rather you let it hang freely, it doesn't care. 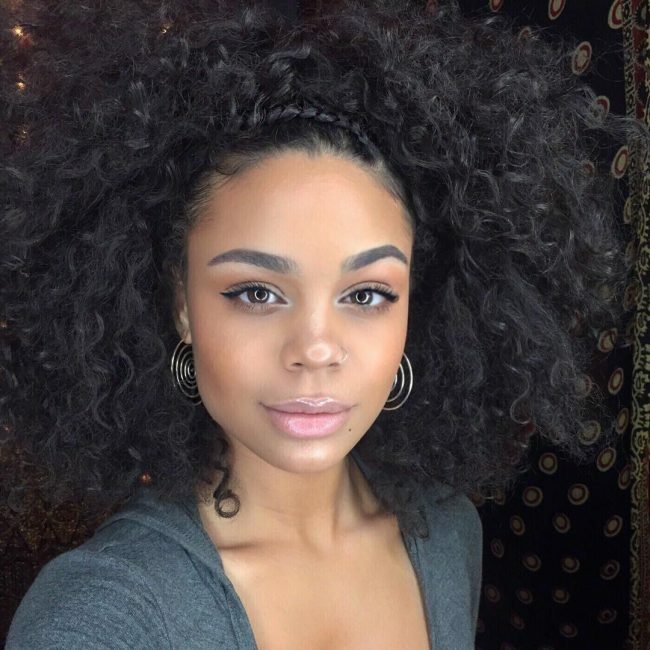 This girl suggests an excellent idea with all the hair hanging, though a side swept on both sides makes the hair embrace her face. This style will make your friends freeze especially when they see how the hair falls on your cheeks perfectly. Here’s another way to keeping your chic hair from looking like everybody else’s. The trick is keeping it simple, but rocking it in a unique way. Gather the hair at the crown and secure it with a bun. In that way, you'll create a beautiful tight top bun. From there, brush the rest of the hair down and let the curls flow. Here we have the exact hair that will make every head turn. In fact, you don't even need accessories because it's perfect the way it is. If features strange sleek locks, all brushed to fall to the sides smoothly. Note that you'll need to tame all the flyaways when making this look. Feel free to take it to either your formal or casual occasions. Some styles are all about self-expression, and showing off how daring you are when it comes to pulling out a striking look. That’s why you see most of the trendy women wearing amazing 'notice me' hairstyles. The idea behind this appeal is going wild with your creativity. 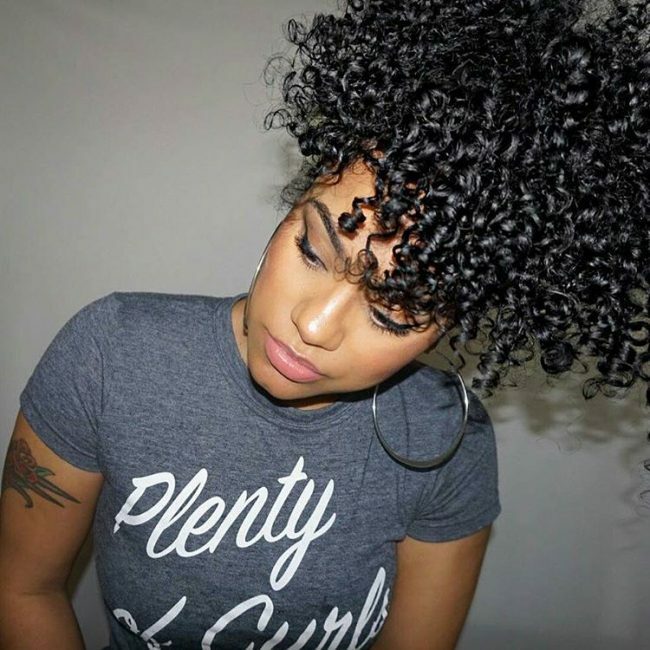 Go for long curly bangs and short sides. That's it. Do you know that some adorable and simple styles look complex when you add accessories to them? In particular, think about this style. It looks complicated, but thanks that we know that it's an afro style. The only thing that makes it look complicated is the headband parting the hair to the sides. 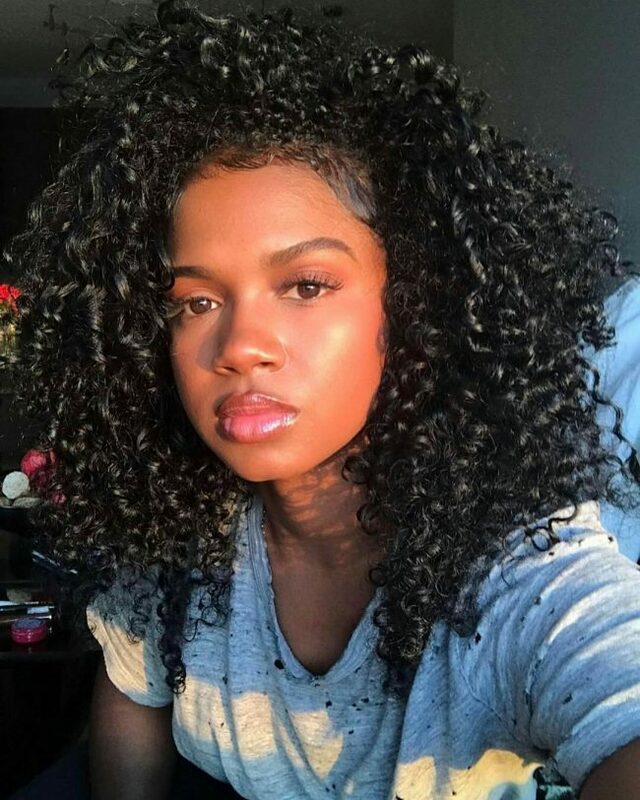 The short black locks in this hairstyle are definitely classic, but the sumptuous profusion of curls at the top is the real accent of the overall look. To be frank, this woman is feeling her bold and femininity appeal right now, and she knows it. Like any other trendy style, the key thing is creativity. For instance, no one would have thought of pulling out long bangs at the top with extended curls. More than that, pairing the bangs with extremely shortened sides is an exceptional idea. 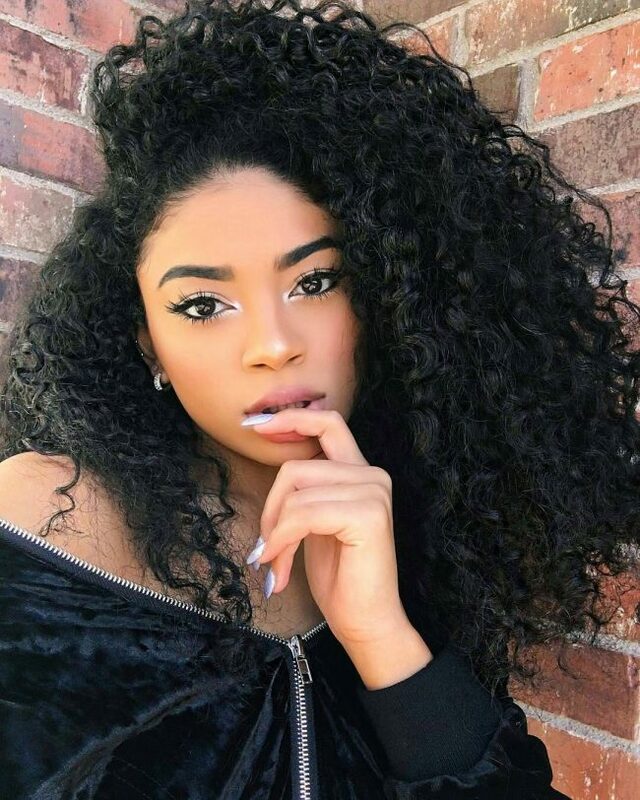 This striking long hair is all curly and voluminous, plus it shows off the black shine in the entire head. 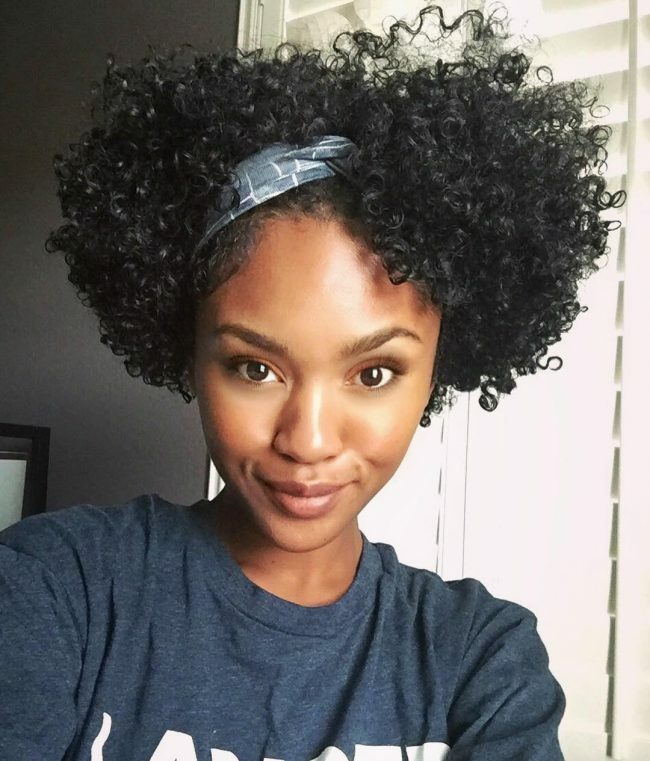 This time round, women are not joking when it comes to embracing their natural hair. It's a way of rocking a style that oozes all feeling of elegance. And again, rocking a style that stands firm to show off your beauty without showing any signs of retreating. Like in this look, this girl throws a deep side part with to natural hair, something that very few tresses can achieve. Besides all those, it's a simple and effortless style to handle. 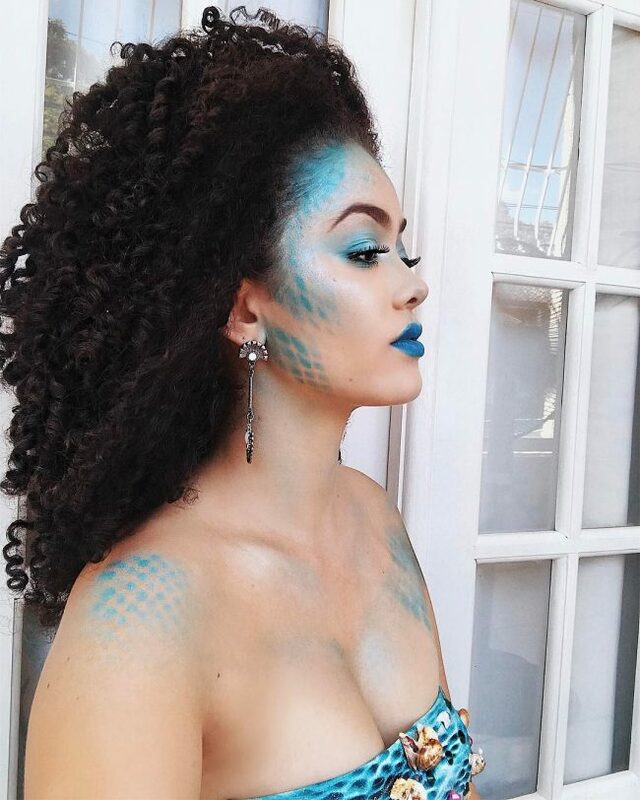 Want to give yourself an entirely unique look? 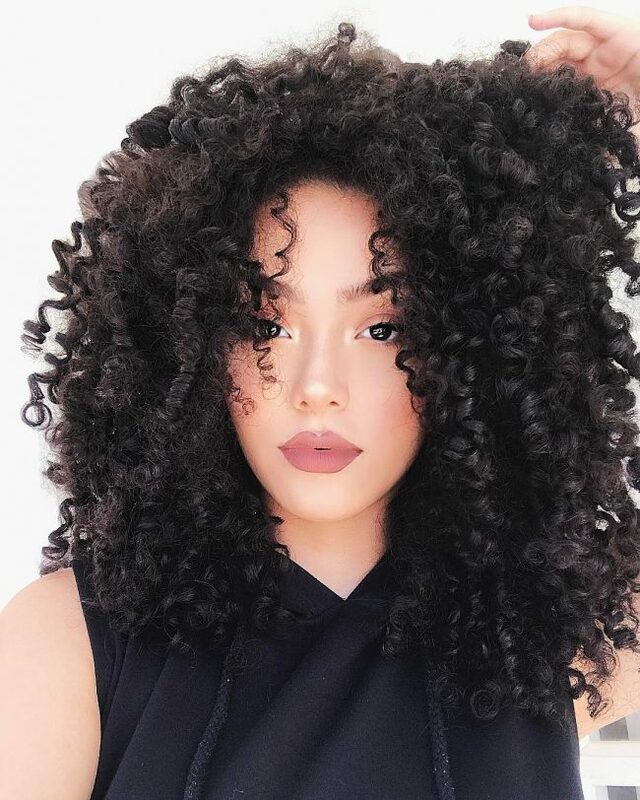 Well, try giving your locks an accent with curls for a touch of glamor. Try to let that become your everyday appearance, and you'll get a different name from the one they call you. By the way, the style right here is one of the quickest ways to achieve such effects. All that you need is the reddish copper shade. 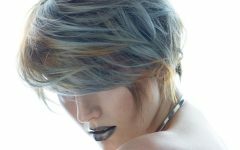 While coloring it, make sure you create a superb color melt from the dark roots. 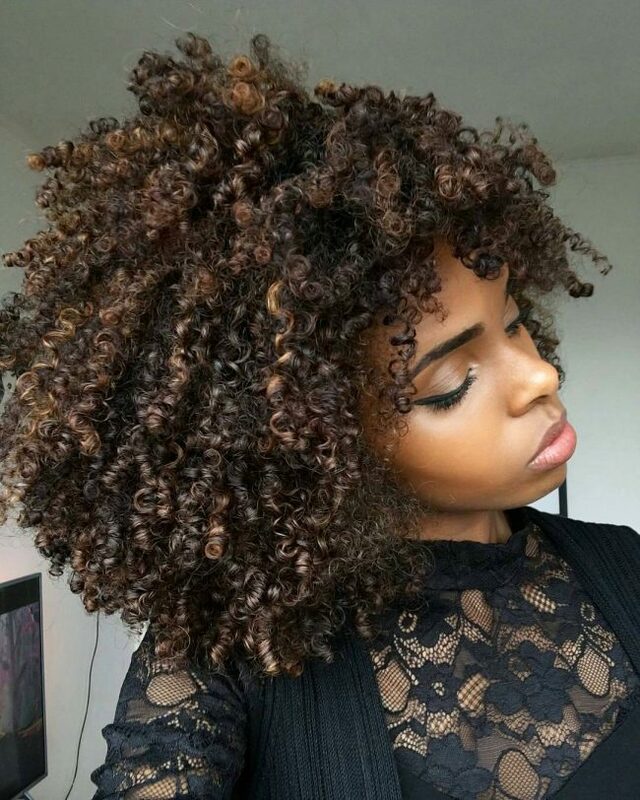 The strange thing with natural locks is that they can sometimes look complicated and even seem difficult to achieve. However, they surprise you when you find that they are actually very easy to create. Take these braids for instance. Even though you'd need time creating each braid independently, the formula is the same, and you can even make them with your eyes closed. When it comes to the finished look, the funny thing is that you get not only a unique style but also a style that has various possibilities of taking a different shape. Just try it. Incorporating a bright bit of tones at the ends truly makes a bolder statement. One thing you should know is that a trendy hairstyle looks at various factors. No doubt, elegance is one of those factors, but still more factors need to come in. Some of those are whether the hairstyles will protect your hair. There is also a consideration that whether the style will allow you to go through some busy days. And lastly, whether it'll fight with frizz. If we can consider all these facts among others, this look will incredibly pass the test. 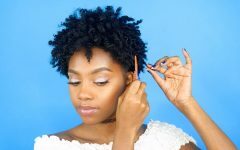 Hairstyles for natural hair are typically the easiest to manage. That's because they can take any texture or any shape that you throw to them. Take for example when styling curls or waves. Don't expect your hair to look weighed down or overdone if you style it correctly. 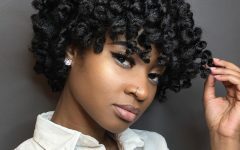 You try styling your natural locks with colors, and everything falls to its place elegantly. Be sure that with any of these hairdos, you'll never complain.